The Burlington area has properties of all shapes and sizes. Tall, short, narrow or long, no matter the style, all of these have roofs. You might not see them, or you might have a clear view of their cluttered surface. Instead of walking passed these issues every day, call our Gorillas to get them solved. Our Burlington roof cleaning and moss removal can get the clutter gone while preserving the condition of your roof at the same time. When you are ready for a win-win scenario, our Gorillas can give you the championship. The problem with having clutter on your roof is the same as having clutter inside your home or business. A bit of clutter has a tendency to attract more! Having large or damp items sitting on the surface of your roof, catches new items and prevents them from rolling or blowing off. As debris piles up, it retains moisture. This moisture can lead to rot, as well as the growth of unwanted plant life, such as moss. Getting rid of clutter is the first step toward a better view of the condition of your roof. Take full of advantage of the lifespan of your roof with our Burlington roof cleaning and moss removal service. Roof clutter is also able to cloak the larger issues going on along the surface of your roof. 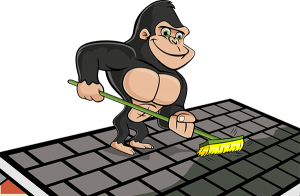 When clutter is removed, our Gorillas can get a first hand look at your moss issues. Now, clutter can be removed easily but moss removal is a more dangerous game. It might seem easy enough to grab a wire brush and scrape that moss away but this can mean big trouble. Moss itself retains a lot of moisture, and as it spreads over and under your shingles and roofing material, it rots and softens. Using the wrong materials can damage softened materials, paving the way for leaks, water stains and sometimes even holes leading directly inside.